Professionally trained actor Dave Belvederi has not strayed away from traveling to be an actor. Born in Italy, acting has taken him from Europe and found him a place in Los Angeles with numerous skills to bring to his trade. "I've always travelled since I was a little kid, so I was never scared of traveling," Belvederi said. "Traveling on your own is way better. It gives you more freedom. You get to see alot of different cultures, different ethnicities, so, it kind of widens your mind." Along with his travels, the skills he picked up while training as an actor have brought him a better understanding and more to bring to each of the his roles. While in New York in his first year of college he picked up stuntwork as an interest due to his background in mixed martial arts. Starting with boxing and progressing to kickboxing and eventually more close-quarter combat. "I started training with Ray Rodriguez, he was a stunt coordinator back then," Belvederi said. Rodriguez would encourage him to consider stunt work because of the many years of martial arts. Due to stunt acting, Belvederi was able to keep up his physique so he could be versatile and pursue action roles which would require his training. "The cinema here (in Hollywood) is more spectacular. There's more of an action style, bigger," Belvederi said. "Acting in Europe is very traditional." Coming from Europe, Belvederi never thought he would be able to do both stunt work and acting. Being in Hollywood now he has been able to take advantage and use the traditional training with his stunt training. With two projects coming up Belvederi looks to showcase more of what he is capable of and expand his acting range even further. "Bloody Eyes" has Belverderi playing a detective, which he wasn't use to because he was usually placed in the role of a villain. 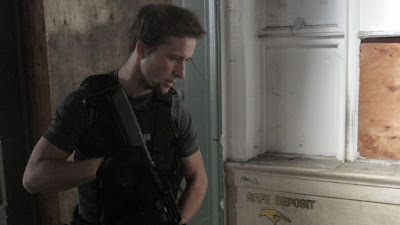 As well as "Rogue Hunter," now in post-production, where Belvederi play mercenary Alex Phoenix. "It was a very demanding role because it had alot of stunts too," Belvederi said. Belvederi rehearsed the action sequences two weeks prior to starting shooting. Which gave him the versatility to adapt to changes once shooting took place. Roles come to Belvederi and he said he is willing to take on a variety of roles because as long as it is challenging it will keep him honing his skills.